Roll rolling machine is one of the important production equipment used in home appliance, pressure vessel, wind power, ship, aerospace, military industry, automobile refit and so on. 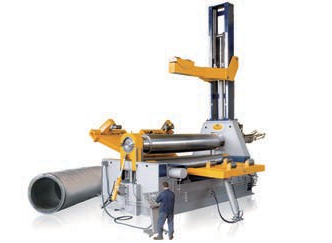 The plate rolling machine is able to bend the metal sheet into a large arc or cylinder, or even an ellipse shape, square shape and a multi-section arc. 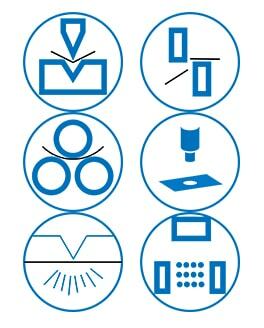 The following is a brief analysis of the types and applications of the plate rolls. The upper roller of twin rolls plate bending machine is the rigid metal roller and the lower roller is the elastic roller covered by high strength polyurethane material. It can be adjusted vertically. When the roller is rotated, the upper roller and the feed plate are pressed under pressure and the elastic layer of the lower roller is pressed into the lower roller to produce elastic deformation. But due to the volume of the elastomer is constant, the pressure pass on all around, and produce high strength, uniform distribution, continuous action of back pressure which forced the plate and the rigid roller stay close continuously, the purpose is to make it rolled into a cylinder with rotation. 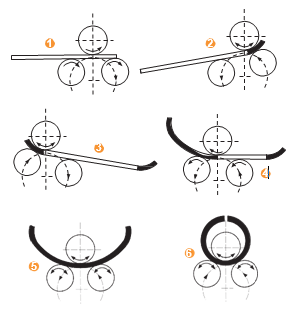 The depth of the upper roller, which is the deformation of the elastic layer, is the main technological parameter that determines the bending radius. According to the experimental study, the greater the reduction, the smaller the sheet metal bending radius, but when the amount of indentation reaches a certain value, the bending radius tends to remain stable, which almost has nothing to do with rolling reduction, this is an important feature of twin roller plate bending technology. Double roller plate bending rolls mainly aimed at the metal plate with the width of 2000 mm, thickness below 2 mm for round rolling, main apply to batch production of a thin container of household appliances. Generally, it can equip with automatic feeding system and automatic discharging system, with a high degree of automation, and high yield. ⑶ Even through punching, cutting, rolling, the metal plate will not produce crack and irregular warping. 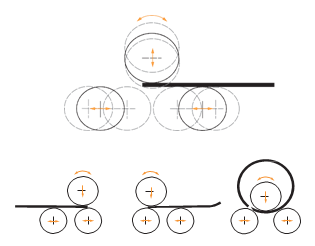 ⑸ If increase the rolling reduction, even the two roller spacing changed, but the diameter of the parts don’t change, so the requirement for precision is not high, and the use of apparatus is simple. Due to each change in the diameter of the making parts need to make guide roller wheel, it is not suitable for multi-variety and small-batch production. It cannot be processed with the thick plate and the maximum thickness of the plate is 6 ~ 9mm. 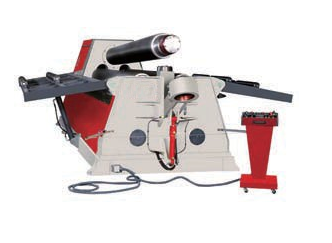 There are many kinds of three rolls plate bending machine, which can be divided into mechanical and hydraulic types. If distinguished from the structure, it can be divided into inclined three rolls plate rolling machine, horizontal under roller move type and geometric variable type. 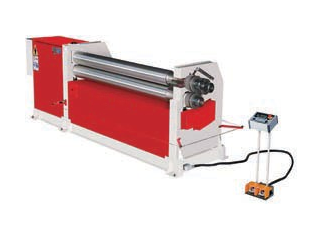 Generally, asymmetrical 3 rolls plate bending machine is driven by a mechanical motor. Both the upper roller and lower roller are fixed power roller, however, the upper roller is fixed while the lower roller can be lifting and rotation. The lower roller mainly works together with the upper roller to press the front end of the metal plate. Meanwhile, the side roller which serves as the subsidiary roller lift up to deform the plate bending. The rolling of the upper roller and lower roller will realize the round rolling and arc rolling of the metal plate. 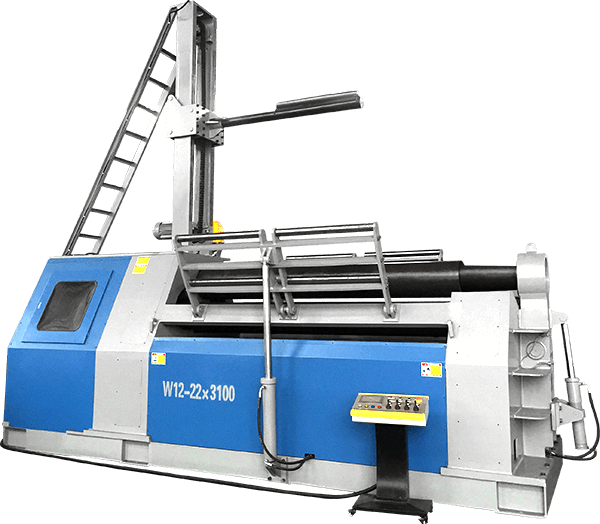 Asymmetrical 3 rolls plate bending machine is applied to roll low carbon steel which length below 2500mm and thickness below 4mm into cylinder or arc segment. In the process of working, the plate rolling process is fast, saving energy and reducing the production cost. However, the pre-curving linear segment is twice the thickness of the plate. And need skilled workers to operate the machine, the technical requirements of personnel are higher. Horizontal lower roller move 3 roll plate rolls are the most common plate rolling machine, which is also relatively mature rolling machine both in the home and abroad. Generally, it adopts hydraulic driven. Its working principle is as follows. The upper roller is the fixed rotation power roller, according to different process requirements, two side roller move on default arc track during the working process, pressing metal plate together with the top roller, and the rotation of upper roller will finish the cylinder rolling or cone rolling. Generally, the rolling width and thickness can reach 4000mm and 6-40mm separately for horizontal lower roller move type 3 roll plate bending machine. The greatest advantage is a cheap price. However, it requires high for operators since the roll forming can’t be finished in one-time process. The linear segment of pre-curving is greater than 2 times plate thickness. 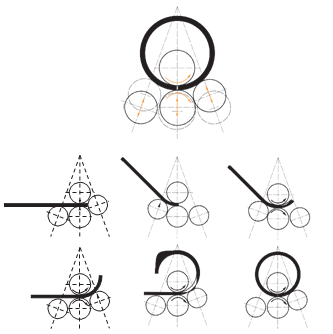 The following image shows its working principle. The upper roller is the power roller which can be moved upward and downward. 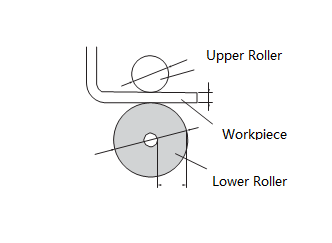 Two side roller is driver roller which can move in horizontal independently. Every roller’s movement can form a geometric shape. That’s why it been called geometric variable plate rolling machine. In the process of processing, it realized horizontal plate feeding, pre-curving, no need for side push device and side roller move outside. Besides, the bending capacity increases sharply. The pre-curving linear segment is not greater than the thickness of the plate. 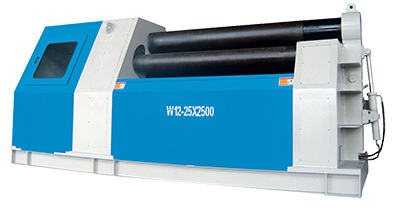 Can replace upper roller with different diameter, can equip with numerical control system with PLC, low requirement for the operator, almost has no pre-curving linear segment, horizontal feeding, does not need to equip with expensive side push device, able to rolling large angle conical workpiece, price below the four roller plate bending rolls with same bending ability. The rolling speed is a bit slower than 4 rolls plate bending machine, can’t roll multi-segment arc shape. 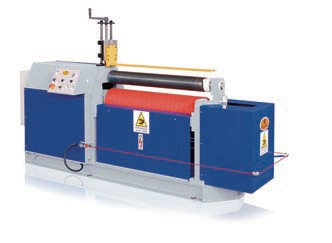 Four roller plate bending rolls are one of the most reliable rolling machines for the manufacturing industry. It is a universal machine, which can roll multi-segment arc shape, o-shape, square, circular, arc, etc. It can also equip with the man-machine dialogue CNC system with a high degree of automation. The four rolls are generally divided into mechanical type and hydraulic type, and the mechanical type of four roller rolls is been used to a rolling metal plate under 6mm thickness, and the hydraulic type four roller rolls are able to roll up 6-200mm thick sheet. 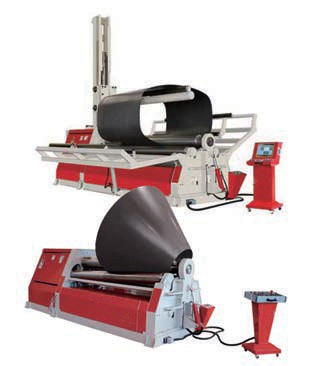 The following image shows the working principle of 4 rolls plate bending machine. The upper roller is rotated power roller which is fixed and lower roller can be moved both upward and downward. It mainly works together with the upper roller to clamp metal plate. Two side rollers move up and down in oblique direction. The function is plate positioning and forming. The working principle of 4 rolls plate bending machine in the market is the same, there only has structure difference. 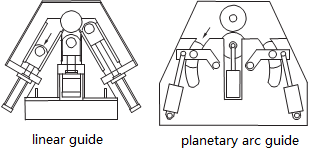 Some side roller movement has planetary arc guide while the others have the linear guide. Before the year 2003, the 4 rolls plate bending machine mainly adopt linear guide. After that, planetary arc guide occupies the market. Some of the manufacturers stick to use the linear guide, even with high cost, but it’s convenience for maintenance. It also has a great advantage for rolling high alloy plate or titanium alloy material. However, I think for the metal plate with yield strength less than 500Mpa, there’s not too much difference. And the using cost with planetary arc guide will be much lower. It can satisfy the whole range of sheet metal rolling, high degree of automation can be equipped with automatic up and down feeding devices. The pre-curving straight line is more than 1.5 times the thickness of the plate. In addition to the above common plate rolls, there are some special rolls, such as vertical rolls, stiffened drum rolls, and ship rolls, etc.